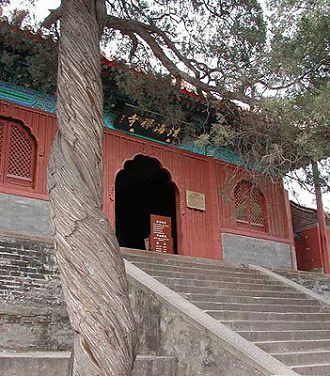 The Fahai Temple (fǎhǎi sì 法海寺) is Ming-Dynasty Buddhist temple located at the foot of Cuiwei Mountain (cuìweī 翠微), about two kilometers to the north-east of Moshikou (mó shìkǒu 模式口), Shijingshan District, Beijing City, China. Fahai Temple is well known in the world for its ten large well-preserved murals in the Mahavira Hall. It was built according to the geological situation and scaled upward along the mountain. The Hall of Doctrine Guarding Buddha's Warrior Attendants houses the towers of bell and drum on the left and right sides. On the high platform there are the former sites of the Heavenly King Hall, Jialan Hall and Master Hall and two corridors. The Main Hall sits in the middle. In the temple, the background of Buddha altar is painted wit propitious clouds drawn with smooth drawing lines and painted with bright colors. 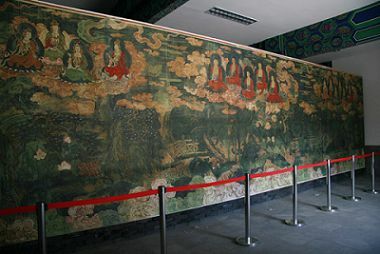 Large-scale paintings of flowers such as rose, peony, palm, and lotus are painted on the walls, and the painting All Buddhas Attending the Meeting is on the upper part of the walls. On the north wall there is the painting God Explains Sanskrit in Heaven, on which the gods in different postures and with different characteristics are arranged vividly in a uniform layout and the same action. The Buddhist figures on murals of Fahai Temple have a distinct characteristic of that time. 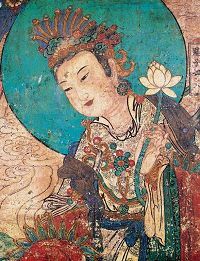 The whole mural embodies the traditional creation since the Tang Dynasty (618-907) and the Song Dynasty (907-1279), and reflects the highest level of mural painting skills of the Ming Dynasty (1368-1644). Due to the use of valuable painting materials and elaborate painting techniques, the murals of Fahai Temple hold an important status in the aesthetic history of China and reflect the splendor of imperial architecture.